Balancing work and family can be hard but as a parent who wants their children to succeed in the future, you still need to create time for your kids. The quality of the time you spend with them matters more than the duration and this is why should make every moment meaningful and constructive. Do not just buy stuff for your kids and leave the parenting responsibility to the nanny. You have to spend time with them and play an active role in their growth and development and shaping their behavior. Here are ways to spend quality time with your kids . As a parent, you should be your children’s foremost role model. Be a good role model to your kids. Children learn from your actions rather than your words so the way you treat them, your partner and everyone around you should be reflective of the values you want them to learn. Be appreciative of their efforts and achievements, be it in school, extracurricular activities and around the house. Encourage them to nurture and grow their talents and teach them the values of hard work and perseverance in order to succeed. Take advantage of the weekends to get your kids outdoors and enjoy each other’s company. Being out in nature improves creativity and can help manage symptoms of ADHD and depression. There are a lot of outdoor activities that are both fun and children-friendly. You can pack a few snacks and a portable refrigerator ( View Site ) and go on a road trip or a picnic at the park. Alternatively, you can tend to the garden together. Actually, it doesn’t even matter what you do as long as it’s healthy and you do it together and enjoy it. You should give your kids undivided attention when you go out. So keep off the phone and focus on them. How often do you make and hold conversations with your kids? It will surprise how much they learn and how fast they grow over a seemingly short period of time. Take time to hold talks with your kids. Listen without interrupting or criticizing and they will be more open and honest with you and from this, you can create stronger bonds with them. You may want to switch off the TV for this and avoid other distractions like your phone. This will make them feel loved and cared for and maybe what they need to avoid risky behavior like doing drugs and alcohol. Instead of spending your time indoors preoccupied by the TV or the smartphone, you can teach your children responsibility by introducing them to age-appropriate chores. Split the chores so everyone has a duty to perform and at the end of it, you can reward yourselves with some healthy snacks or order some takeout and sit down for a movie or a storytelling session. You can also cook with your kids which is a great way to teach them about culinary skills and kitchen as well as healthy eating habits. 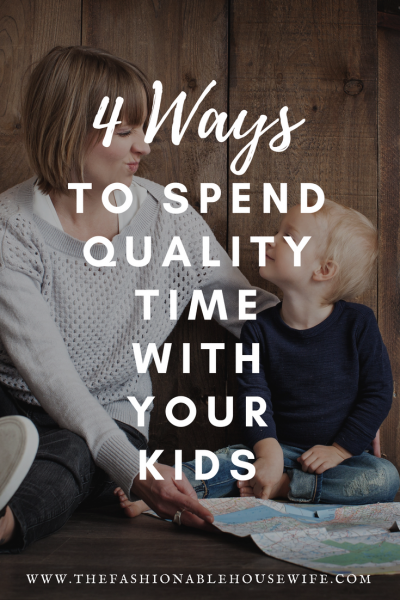 The post 4 Ways To Spend Quality Time With Your Kids appeared first on The Fashionable Housewife.